Hello All! Hope you are well - the sun is shining in North Yorkshire - so life is good! On the 8th of May, Kerry (that's me! Lol!) will be running a workshop here at the Paperlane on making these cute paperbag books. They are bit more work than a standard 6x6 card, but are such a lovely keepsake - and they are really quite addictive to make too! All materials, tea and coffees will be supplied - just bring your craft kit, and a packed lunch! Here is the sample of what we will be having a go at - all the lovely materials used to make this are stocked at The Paperlane. Please drop us an email for details booking a place - you will find the address in the 'About Us' Section. All of the papers used on the paperbag book were Basic Grey - Kioshi Collection. The cardstock used is Bazzill Basics. The front cover - with ties to close the book. 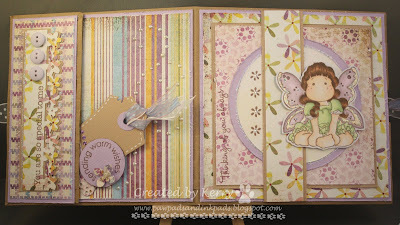 The main image here is from the new Butterfly Dreams Collection by Magnolia Stamps. The detail die cut is a Tim Holtz 'Elegant Flourishes', decorated with Hydrangea flower blossoms, punched with a Martha Stewart punch. The main image again is from the Butterfly Dreams Collection. 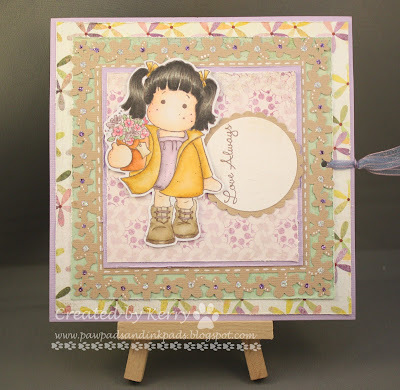 The sentiments are all Hero Arts, with a Magnolia Doo Hickey tag. Again, the image is from the Butterfly Dreams Collection. The sentiments are all Hero Arts. The detail punching has been done with a Cherry Blossom Martha Stewart 'Punch Around The Corner' set. The back cover - decorated to show who sent it! Lots of glitter and Viva Decor Pearl Pens just add a few finishing touches. Looking forward to seeing you! All the details for our regular classes can be found here!